Pete's Blog: Tekapo goes Trippo! 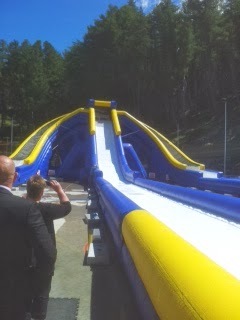 Last Friday I attended the grand opening of 'The Trippo' at Tekapo Springs, on the shores of beautiful lake Tekapo. The Trippo is one of the largest inflatable slides in the world, 11 metres high, 53 metres long and with three chutes for full on fun! It is perfectly positioned on the Tekapo Springs ice skating rink to ensure full utilisation of the rink space, year round. It is a great new attraction and guaranteed to be a big hit with the kids. It adds to a the other superb offerings Karl Burtscher and his team have created at The Springs. Next time you are heading to, or through, Tekapo make time to visit The Trippo. You will not be disappointed.